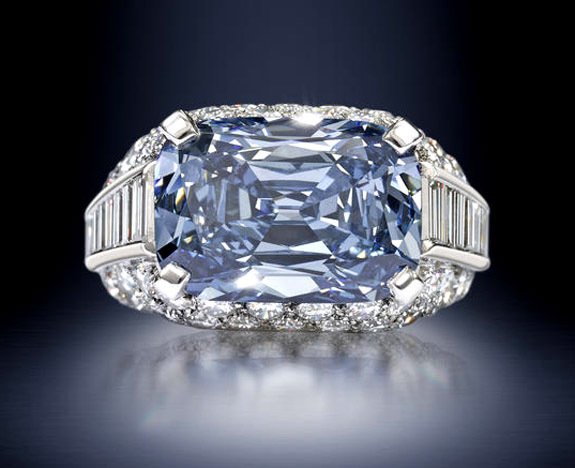 British billionaire Laurence Graff added still another famous colored diamond to his world-class collection last week when he placed the winning bid of $9.5 million at a packed house at Bonhams' Fine Jewellery sale in London and walked away with a 5.3-carat fancy deep-blue diamond ring. The “Trombino” ring, which was designed circa 1965 by Bulgari, sold for nearly four times the pre-auction estimate and set a new world record for the highest price per carat ever paid for a blue diamond — $1.8 million. The distinctive ring features a cushion-shaped blue diamond set horizontally. It is accented with pavé-set brilliant-cut diamonds and courses of baguette-cut diamonds. According to Bonhams, less than 1 percent of all diamonds mined are blue diamonds. Collectors from around the world clamored for the privilege of owning the ring. The auction house reported intense bidding from a packed sales room and 25 phone participants. The victorious Graff also has the distinction of possessing the world's most expensive gemstone — a fancy intense pink diamond known as "The Graff Pink." The 24.78-carat diamond set the record at a Sotheby's auction in November 2010 when he bought it for a staggering $46.1 million — or $1.85 million per carat. In December of 2008, Graff spent $24.3 million for the 31-carat fancy deep-blue Wittelsbach Diamond, and in November of 2012, he bought an exceptionally rare deep blue briolette diamond for $10.86 million. That diamond weighed 10.48 carats and was the product of the famous Cullinan mine in South Africa.